I am looking for help with identifying this plant. 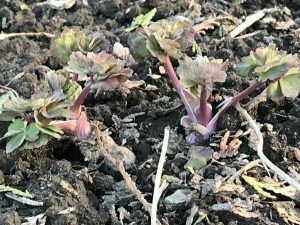 It is newly emerging (mid April) in a garden bed in Toronto, Ontario. There are many of them, concentrated in one area. The bed is in partial shade under cedars. I don’t recall seeing these emerge last year. This is likely Aquilegia (pronounced a-kwi-LEE-jee-a), also known as Columbine. There are approximately 70 species of Aquilegia plus numerous hybrids and cultivars. Columbines self-seed freely, so it is possible that some seeds were carried by wind into your garden from a neighbouring property. At this stage of growth, it is not possible to know what colour or form the flowers will have. Columbines produce flowers in an array of colours and forms. They are highly promiscuous and where there are populations of different Aquilegia species, they will often cross to create new hybrids. Columbines are herbaceous perennials; they can grow in full sun but often prefer partial shade in fertile, moist but well-drained soil. If you leave the flowers on the plant and allow them to go to seed, they may continue to seed themselves within your garden. If you wish to prevent their spread, you can cut them back after flowering and before they form seedheads. Columbines are beautiful late spring/early summer flowering plants and are attractive to beneficial pollinators. Congratulations on these lovely, free additions to your garden! Also, please send us a photo when your plants do bloom, so we can see the flower form and colour.